"Hotel San Pietro is an outstanding hotel in the midst of a c..."
Have a question for Hotel San Pietro? "Good breakfast and good restaurant for dinner." "Food and service excellent with great views"
"Our triple room was large and the shower/bath nice." 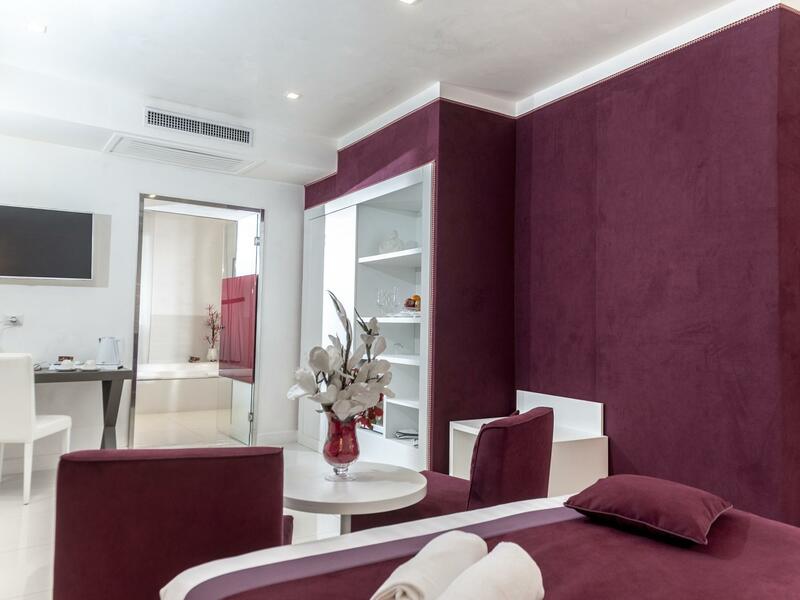 When visiting Naples, you'll feel right at home at Hotel San Pietro, which offers quality accommodation and great service. From here, guests can enjoy easy access to all that the lively city has to offer. 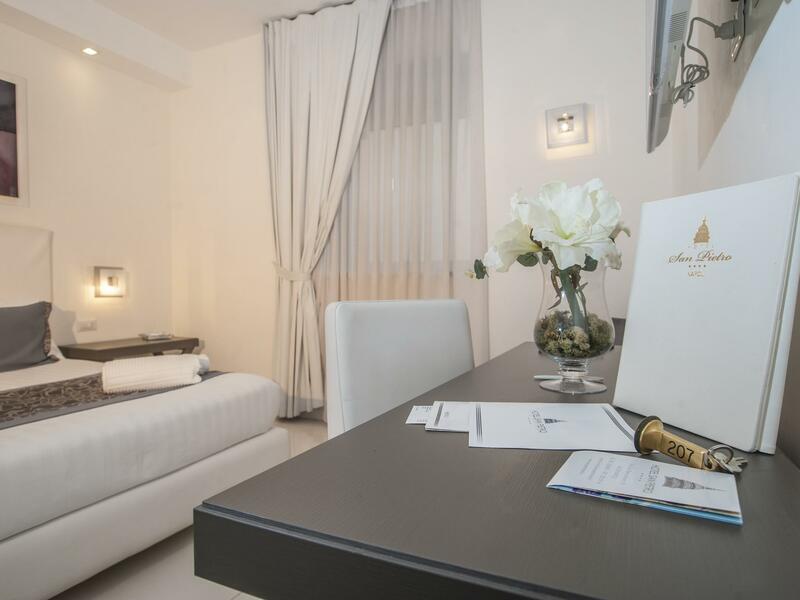 A well-kempt environment and its proximity to Basilica di San Pietro ad Aram, Basilica dell'Annunziata Maggiore, Santissima Annunziata give to this hotel a special charm. 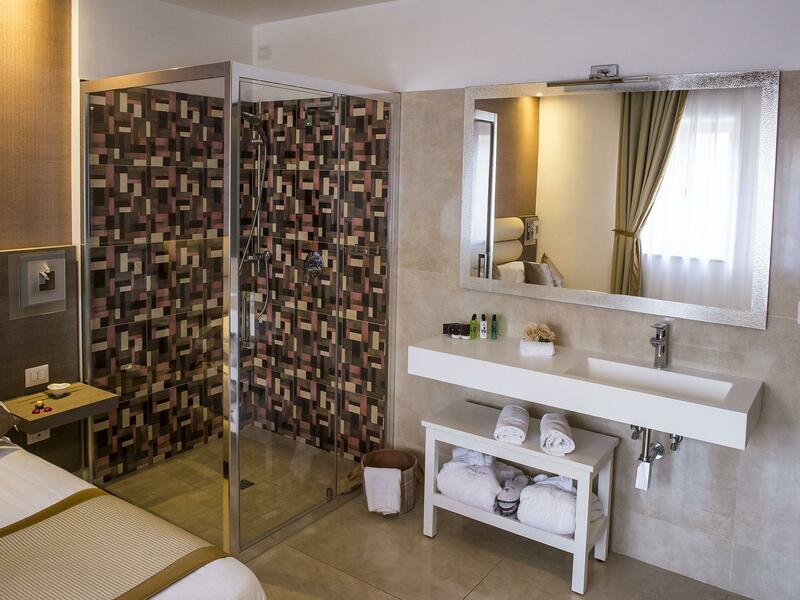 Hotel San Pietro offers impeccable service and all the essential amenities to invigorate travelers. A selection of top-class facilities such as 24-hour room service, 24-hour front desk, luggage storage, Wi-Fi in public areas, room service can be enjoyed at the hotel. Hotel accommodations have been carefully appointed to the highest degree of comfort and convenience. In some of the rooms, guests can find internet access – wireless, internet access – wireless (complimentary), non smoking rooms, air conditioning, heating. Besides, the hotel's host of recreational offerings ensures you have plenty to do during your stay. Superb facilities and an excellent location make the Hotel San Pietro the perfect base from which to enjoy your stay in Naples. "Great staff, really friendly and helpful Quiet hotel despite..."
We had a great stay Hotel San Pietro. It was within walking distance to the main train station which made it easy to visit the nearby areas. The staff was great and took care of us during our stay. Great value for the price. Hotel San Pietro is an outstanding hotel in the midst of a city that is in need of some attention. It is a quick 10 minute walk from the train station. The facilities was clean and the staff extremely helpful. The rooms are spacious for Europe and well appointed. Breakfast was held upstairs on the roof top and you have your choice of inside or outside seating. Food was plentiful with an array of pastries, fruit, coffees, eggs, meats, cheeses and fresh juices. It is just off one of the main streets where there are ample shops and restaurants. 10 min walk to the best pizzerias naples has to offer. Would definately stay here again if visiting this area. Highly recommend this hotel if you visit Naples. 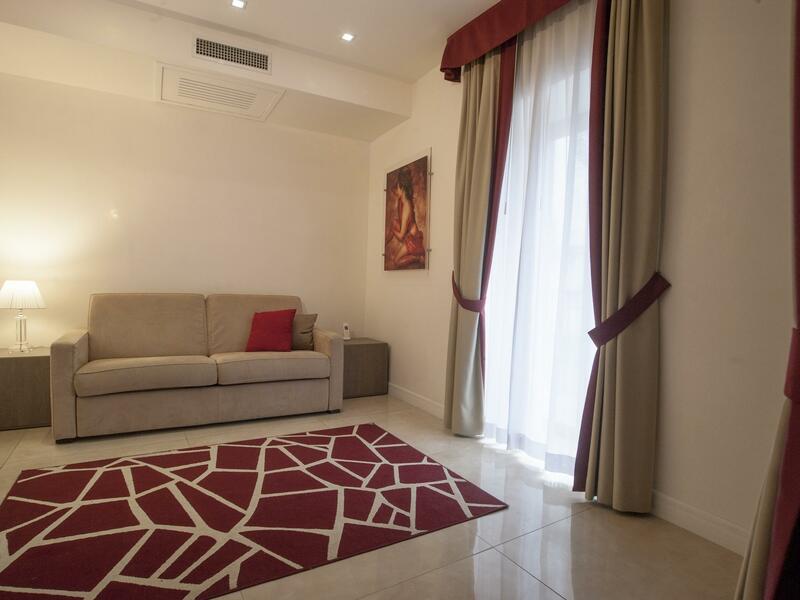 It's near the Centrale train station and is located along the main street to all the sights in Naples. the staff are very helpful and friendly. buffet breakfast is absolutely amazing with a good spread. rooms are big, well furnished and clean. Two thumbs up for this hotel! I had a very nice stay for one night at the Hotel San Pietro. The check-in staff were very kind, and because I made the booking online with Agoda only a few hours prior to arrival, they did not have any record of the booking when I arrived, but this was no problem at all. I gave them my booking number and when the official message arrived from Agoda, there was no further mention at all. The breakfast on the rooftop was lovely with a decent selection of foods, and the view was also nice. The only complaint was that the wifi was a little weak in the second floor corner room that I stayed in. 9.5/10, I would recommend to anyone looking to stay in a nice hotel in this price range in Naples, Italy. The Hotel San Pietro was one of the best hotels we stayed at in a month-long trip to Italy. It's in a very convenient location near the train station, outside it's noisy and chaotic Naples - inside, quiet and peaceful. 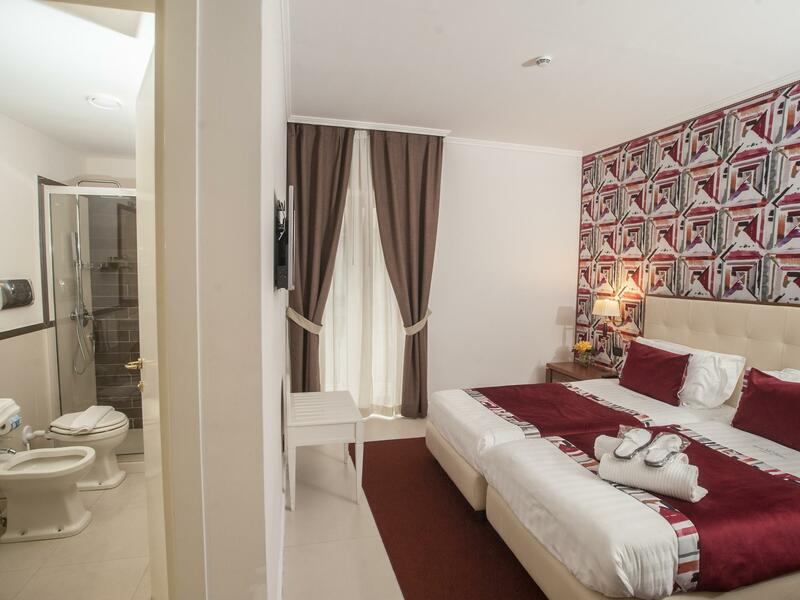 The hotel décor is very contemporary, rooms and baths are excellent, and the staff are very friendly and helpful. I would definitely stay here again on my next trip to Naples. Nice friendly staff. Clean room, but if you like to make tea take a kettle (we had a standard room). The breakfast had mainly cold food, the restaurant in the evening opened at 7:30pm, which was a little late for my family one of which was an 18 month old. The location is excellent for Garibaldi station if you want to travel to Herculaneum, Pompeii or the Amalfi coast. All the museums are fairly close. A good hotel, we will definitely visit again. The hotel is located by the market where many people work and tour. It is easy to get to the train station and local sites but not the easiest from the airport. I enjoyed the staff who made my stay comfortable and the breakfast buffet was fantastic. I was early and they held my luggage and even printed my train ticket for me. Would recommend!! This is a really beautiful hotel with staff who provide excellent service. Yes, it is I'm not such a great location but we went out for lunch and felt okay. We chose not to go out for dinner, but instead ate at the restaurant in the hotel and found the food to be good. We were in Naples for one night as a layover between amalfi and our flight back home, and this hotel was perfect for us to just relax in! The location is minutes from the metro and train station. The staff was superb! Once you step inside, all the hustle and bustle from Napoli disappears. The view from the terrace is superb seeing the Duomo and harbor- worth having a cocktail at sunset and relaxing. There is only positive things to say about this hotel! 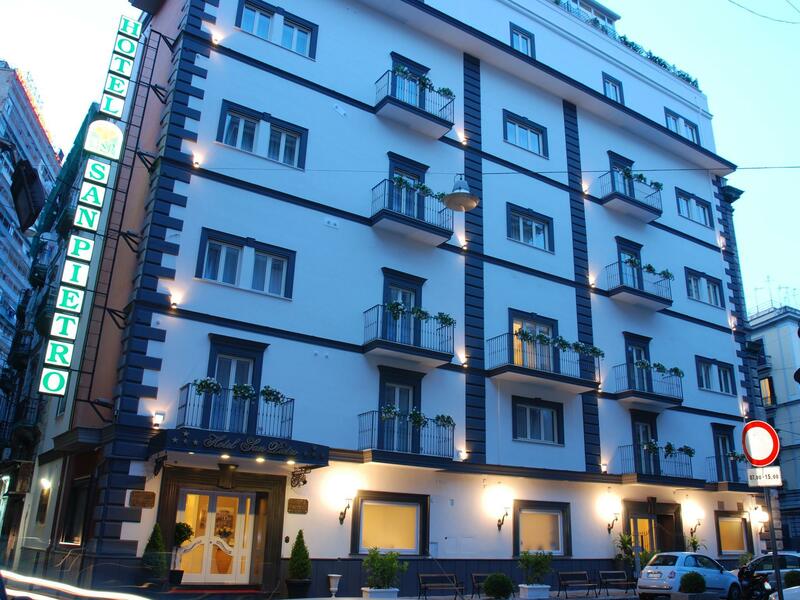 This lovely hotel is perfect for City break, right in the centre with 5 minutes walk from the central train station ( Piazza Garibaldi ). Hotel staff are wonderful and nothing is too much trouble, with quaint old fashion values. Breakfast is very tasty and plenty of it, freshly prepared, fresh local fruits, cheeses and meats etc, lovely start to the day on the roof top terrace . Room very spacious with very high standard of cleanliness. You will not be disappointed. Great location and friendly staff. We were here for just one night. Our triple room was large and the shower/bath nice. Some aspects of the hotel seem a bit worn, like the rugs. There was an overwhelming perfume smell in our room which was helped a little by air circulation. The rooftop breakfast was nice. Very clean hotel and room. Turn down service. Great location. There have been reviews saying this hotel is in a run down area of the city, but it isn't really. If you get out and walk around you will notice most of the older Napoli is just as gritty. Some areas may appear more menacing than others, especially at night, but it is just the way Napoli is. Personally we wouldn't go back but if we did we would certainly consider this hotel. Reasonably priced. Really hard bed. Good shower. Air con didn't work but didn't really need it so didn't report it. Excellent hotel, clean and comfortable. Staff are extremely helpful and friendly. Great location for most attractions (museums) etc. Loads of shops. Naples is quite a dirty city and very crowded but still has its charm. Watch out for pickpockets because it's very crowded it's easy to get distracted. Centrally located, convenient. Staff are great and will bend over backwards to help (e.g., went out to talk to the taxi to get a rate estimate to ensure we won't be overcharged). 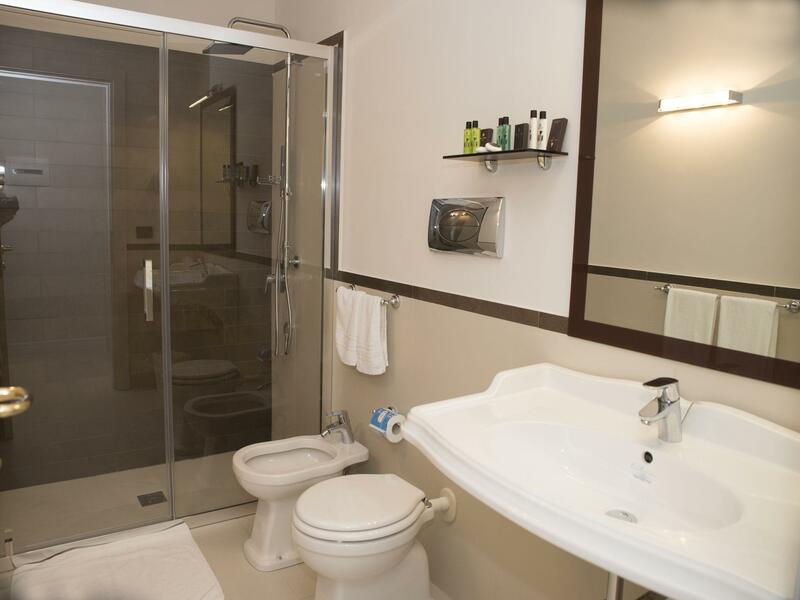 Facilities are sufficient: small clean rooms, nice lobby, breakfast area. Fine hotel for the money. Probably the nicest building in the area. Friendly staff. The door to the kitchen in the breakfast room could use some oil, as the waiter kept going in and out and it was annoyingly noisy! The hotel was lovely and served as a nice rest spot after contending with the hussel and bustle of Naples. Location was close to the station and almost on the main shopping street. Only con is that a kettle in the room would have been nice. Hotel San Pietro is very conveniently located within walking distance from Napoli centrale and many other sights in the centro storico. Staff was friendly and helpful and facilities were elegant and modern.